SOME OF OUR LOVELY GRANDCHILDREN! 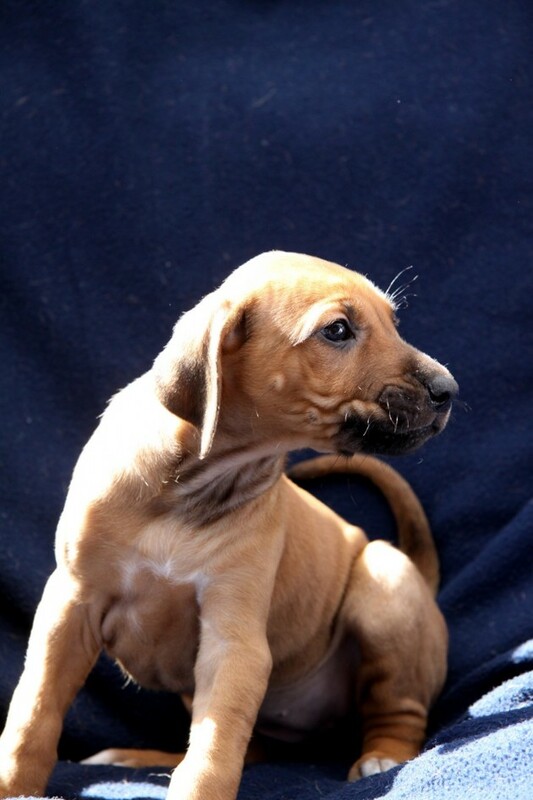 First out Caspians daughter Dunja 8½ weeks old. 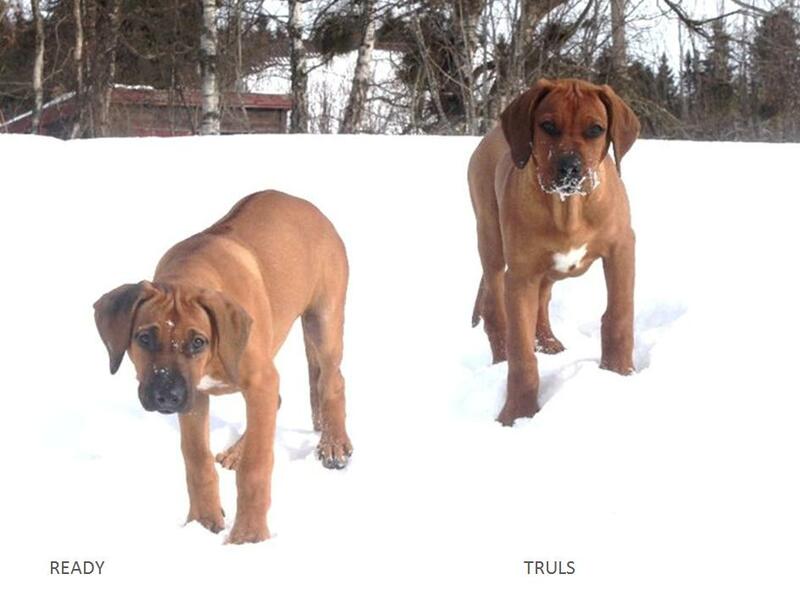 Then Primus son and daughter Truls & Ready how lives in Norway. Primus son Bamse did great last weekend at the inofficiell dogshow in Falsterbo, being BOS! 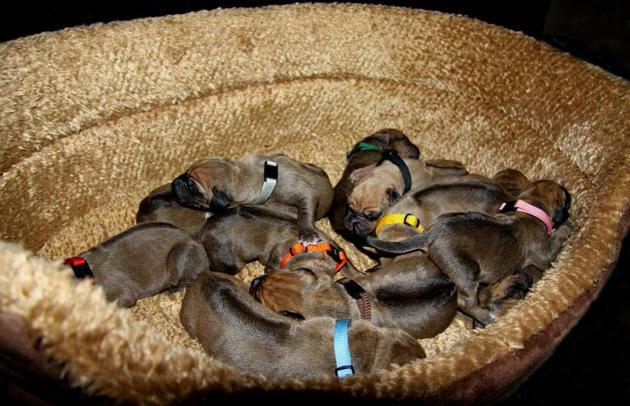 The E-litter is now a little bit over 2 weeks old. All the puppies are growing steadily, some more than others. They are moving around a lot more now and they become more and more aware of each other and their surroundings. 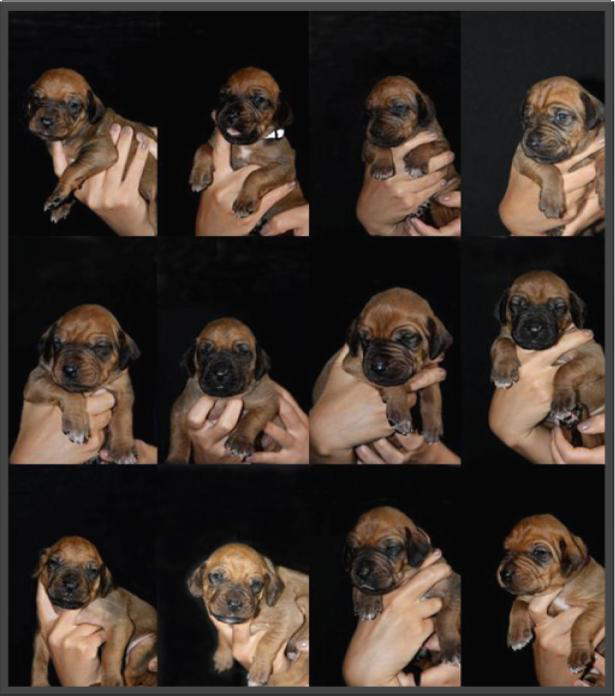 I have updated their gallery with individual headshots taken when they were 2 weeks old. I have also recieved great news from Asla & Minos daughter "Salma" Ghali Great Dream. The other day I took 2 weeks individual headshots of the puppies, and some pictures from their first taste of maizegruel! 25/4 AWENA`S SON GHALI GRAND CINAMON "VILHO"! 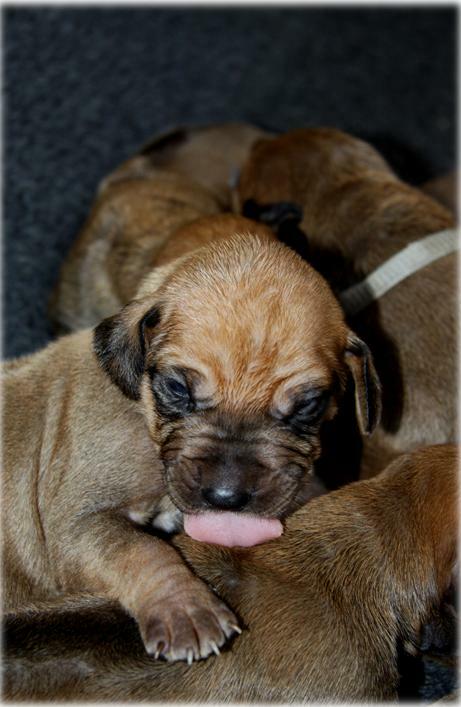 Awena & Wilson´s puppies 2 weeks old today! I will try to take some new headpictures of them today, and update with some more pictures from yesterday when they all enjoyed the minced meat mix. Instead of dragging them selves they are now walking around in the puppy box. My temporary bed is a favorite for both Awena and her babies. Awena has also starting to take shorter naps outside the puppybox. They are all gaining weight and have more than doubled their birth weight by now. 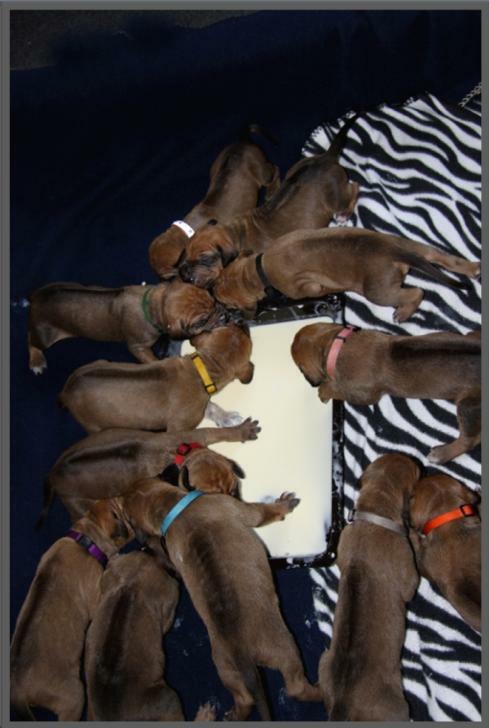 Yesterday they all got to try solid food for the first time, they all enjoyed it! They have also been dewormed for the first time at the age of 10 days. 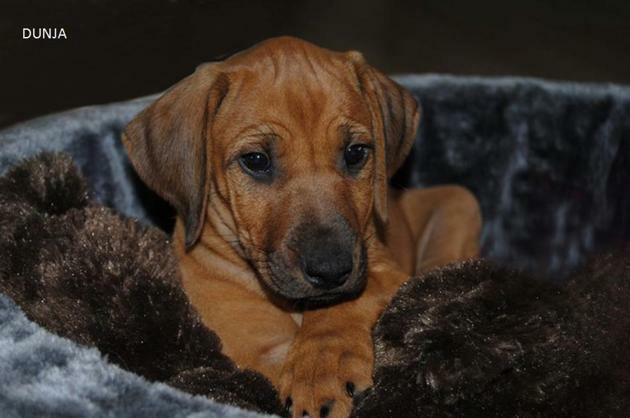 I will update the puppies photogallery with some new pictures soon! 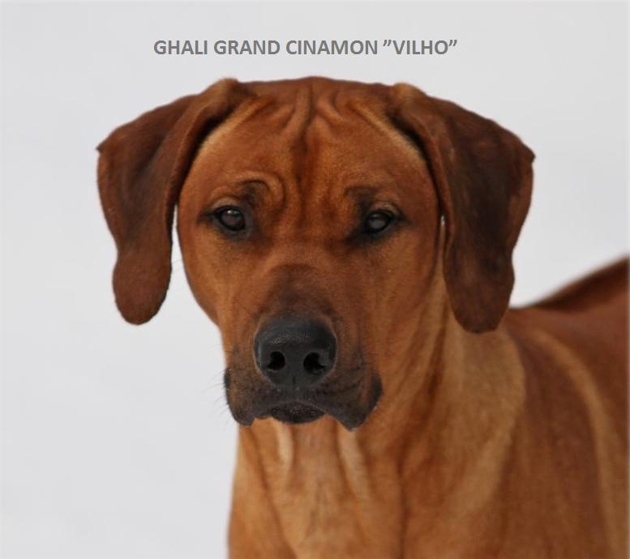 I have also updated Vilho, Caspian and Chimmes critique from their last show. 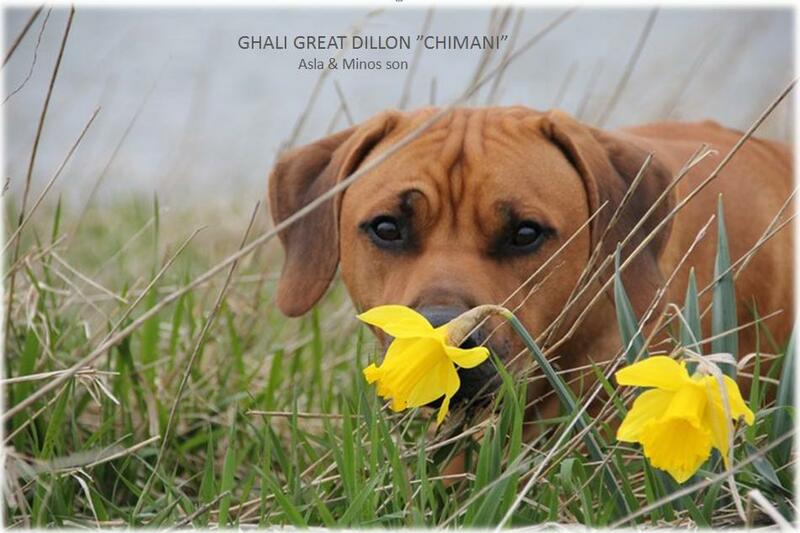 EASTER GREETINGS FROM "CHIMANI" GHALI GREAT DILLON, 14 MONTHS OLD! Two new show champions :) and 12 newborn puppies! 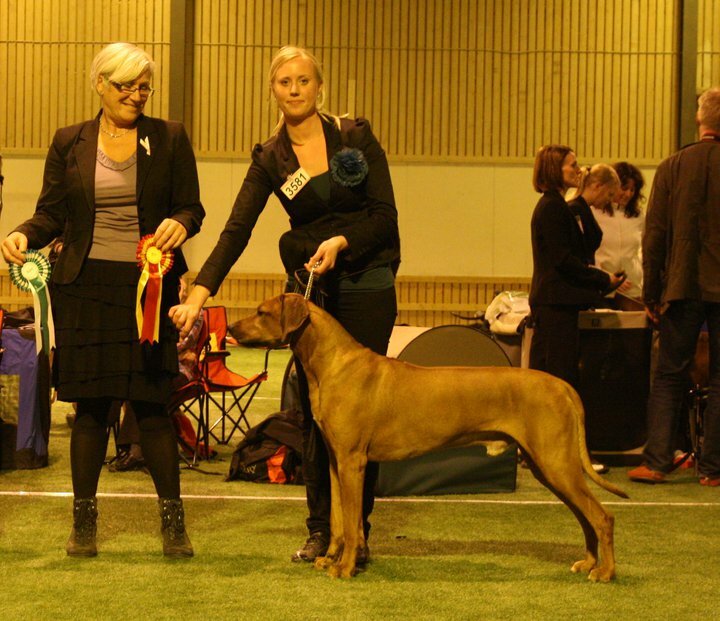 Last weekend became Awena´s son “Vilho” Ghali Grand Cinamon Finnish Show Champion at the Internationel Dogshow in Vaasa :) & yesterday became her other son Ghali Grand Caspian Swedish and Dannish Show Champion at the National Dogshow in Västerås(breed entry 80),we are so happy and proud over this two stunning boys and their owners. 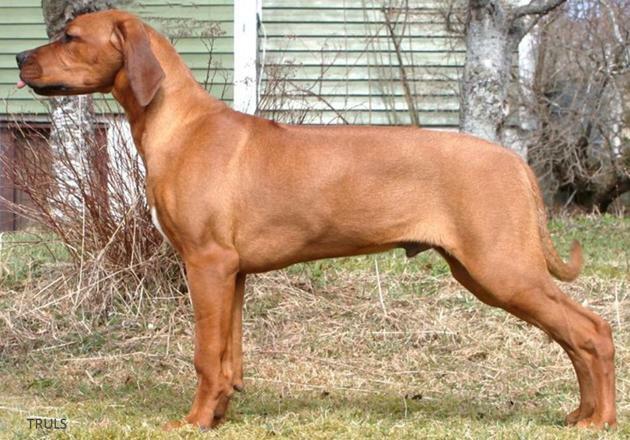 Daddy to our new born puppies (E-litter) “Wilson” Roseridge Red Rastaban became best of breed and daddy to our latest litter (D-litter)African Hunter´s Amazing Baskervill “Minos” 3rd best male at the same show :) huge congratulations to all of you. A report from the puppybox! Today the puppies turn 1 week old! Awena and the puppies are doing very well so far. They are all eating and gaining weight. I have cut their claws for the first time the other day, it was a lot of claws! They are making their way around the puppy box. Some new pictures can be found here >> And I will try to take some individual headpictures today. I have also received a greeting from Denmark and a new picture of Awena´s son “Zulo” Ghali Grand Cole. And one from Finland of Asla´s son “Duke” Ghali Great Diamond. 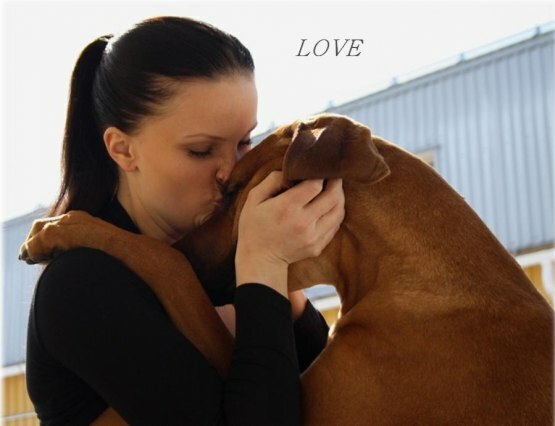 The pictures of Zulo and Duke you can find below. 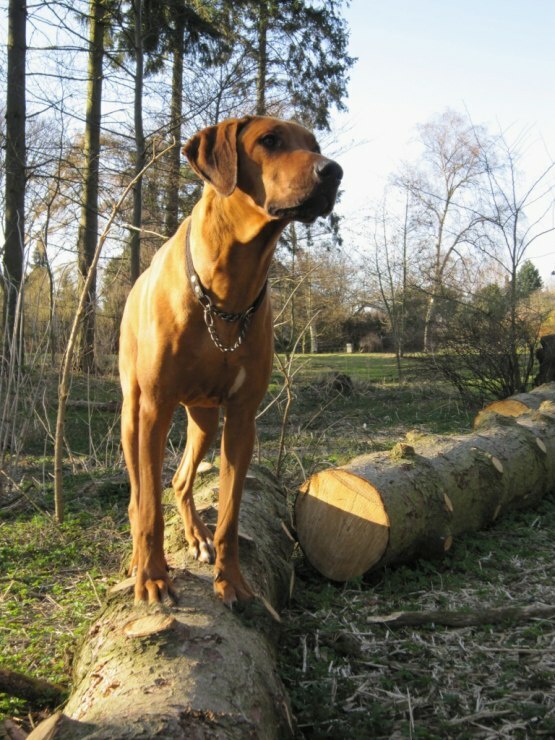 And one picture of our puppies dad, taken yesterday at the showground. Igår åkte jag med Caspians matte Annelie för att hälsa på Caspians valpar hos Lena och Bo. Så söta men vilka valpar är inte det :) en väldigt jämn kull med otroligt fina ridgar. Passade på att ta några nya bilder på gänget som igår var 5½ vecka gamla. Stort tack till Lena och Bo för en trevlig dag i valplådan! 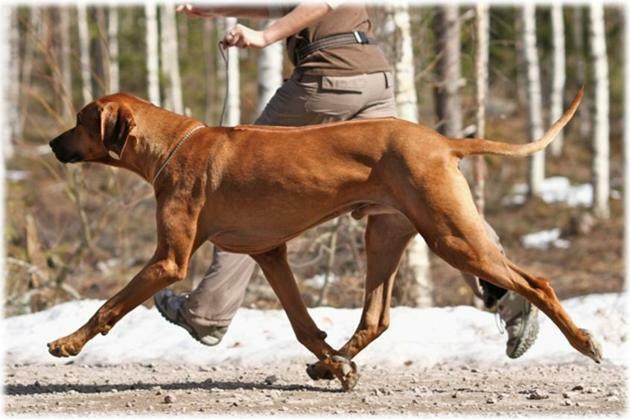 Idag fick jag ett trevlig meddelande från Finland :) Awenas son "Vilho" Ghali Grand Cinamon blev Finsk Utställnings Champion idag!!! 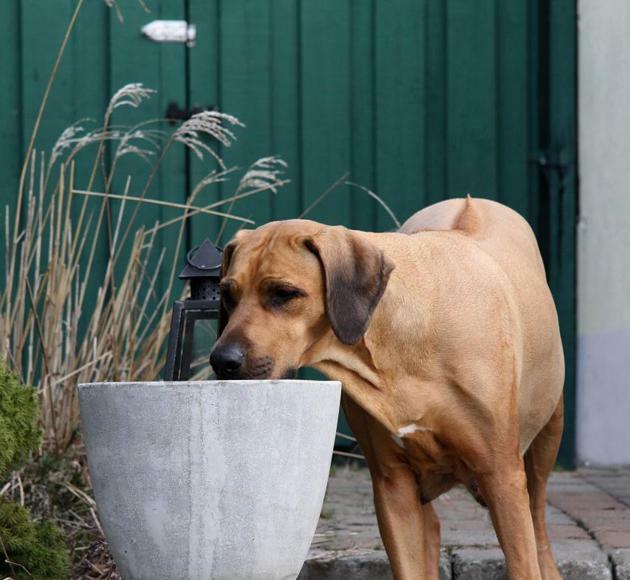 på Vaasa Internationella Hundutställning stort GRATTIS team Nina & Vilho! 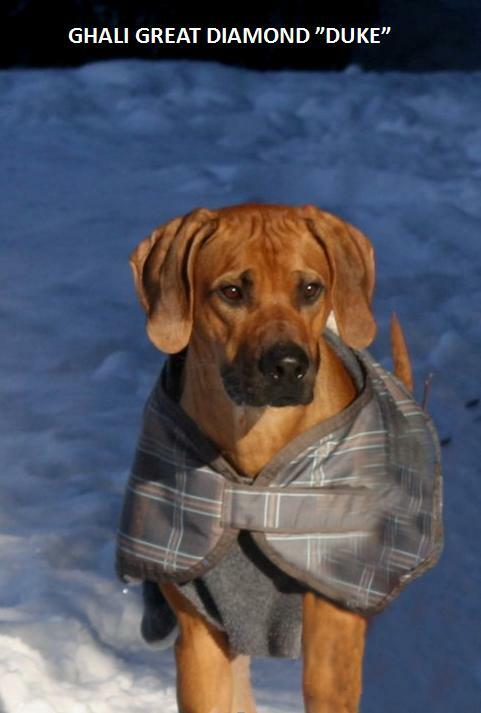 Vilho blev andra bästa hane med CERT och R-CACIB--> CACIB och FINUCH! Här hemma går vi i väntans tider, Awena är väldigt trött, bäddar för fullt, fortsätter gräva i trädgården och är mer tung andad. Vill gärna inte ha något att äta , men jag har fått i henne lite tiksoppa, tror att det snart drar ihop sig. 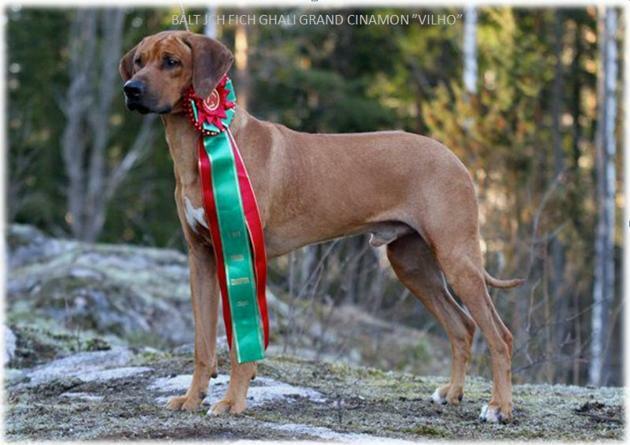 Last weekend Awena´s son "Vilho" Ghali Grand Cinamon and mum Nina entered a dogshow in Finland with following result! EXCELLENT 1, CQ (Championquality) 3rd BEST MALE with R-CAC! Idag är Awena på dag 57 i dräktigheten, och det börjar närma sig! Ute i vår trädgård har hon börjat förbereda med att gräva under vår stora tuija. Hon äter fortfarande med god aptit, men får äta flera gånger per dag. Vi går fortfarande små mindre promenader som hon gärna följer med på. Ibland går hon upp på ovan våningen, men jag och Awena sover nu tillsammans där nere. Jag ska försöka ta några nya bilder och mäta henne, antingen idag eller i morgon. Annars mår hon bra och blir ompysslad som sig bör när man väntar smått! 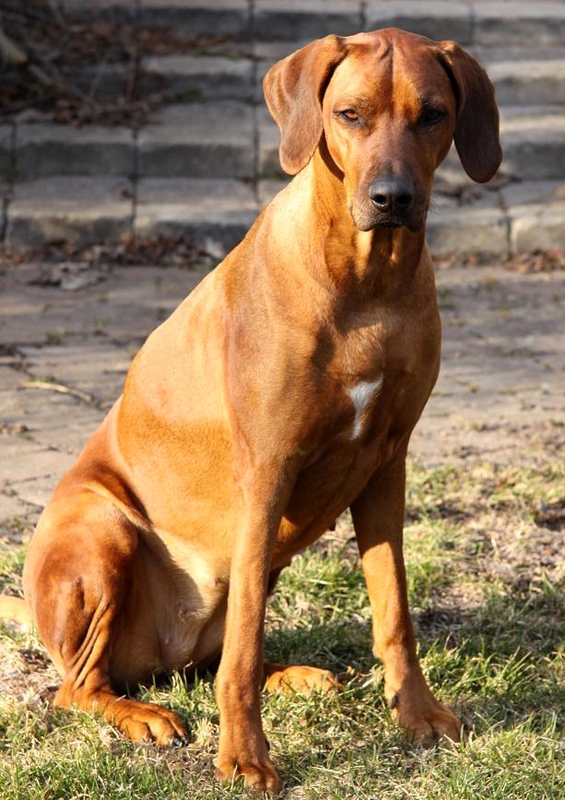 Our sweet Safir & her siblings our B-litter turns 3 years old today!! Our little princess turns 3 years old today!